A Kilt does not have pockets. So where do you place your money, car keys, etc? Hence the Sporran. Be careful not to wear the Sporran too high or too low. It should hang a few inches below the belt. Sporrans are always suspended by a nice chain, although some chains maybe fancier than others. There are several styles of Sporrans: Leather, Fur, Full Mask (face of an animal), and with metal ornamentation. Broadly speaking, the Leather Sporran is more casual than the Fur Sporran. Usually, a Fur Sporran with ornamentation is considered Dress and is called a Dress Sporran. However, today there are no hard and fast rules about Sporran wear. For example, leather Sporrans are often worn with Kilts at weddings with a Daywear Jacket or a formal Prince Charlie Jacket. Should you wear a Belt? 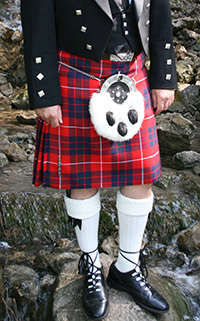 A Kilt looks naked without a Sporran or a Belt. Exceptions to this include ladies wearing a Kilt as dress apparel or wearing a sweater with a Kilt which might cover the Belt anyway. The Belt is also practical as it helps to keep the Kilt from falling and hanging too low. There are a few different styles, some thicker than others. All usually have a nice large buckle which sets off the Kilt. Find a Kilt Belt that suits you. Do not wear any old Belt which is not designed for a Kilt, such as that you might wear with your trousers. Also be careful as to how much Kilt material shows above the Belt. It looks best if none is showing, or just a thin line above the Belt. It looks poor if a lot is showing, so just do your best to manage it.